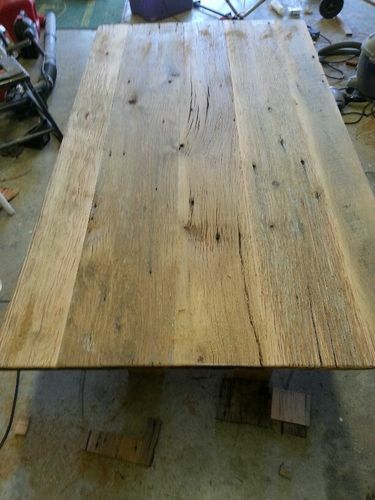 5’ farm table made from reclaimed oak barn boards that were local to my area. I disassembled the barn board by board and seeing the finished product always makes all the hard work worth it. After planing, jointing and lots of sanding, the top is simply finished with a high build polyurethane. I’m designing a table like this for the wife. Did you turn the legs yourself or buy them locally? Very nice! 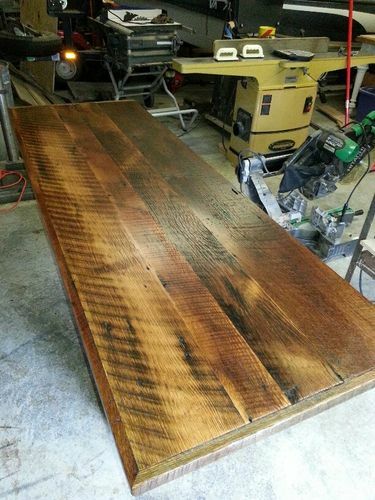 My question with reclaimed wood is whether the planing and sanding compromises the aged/vintage look of the wood? 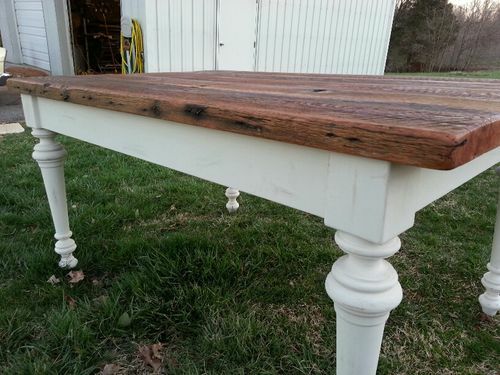 Seems like with reclaimed barnwood like this you would want to do less prep than with “new” wood? How do you decide how much prep is necessary? Thanks! I didn’t turn the legs, I bought them. I don’t have a lathe but really like the look of these style legs. I have gotten legs from a local “picker” who has an abundance that he has gotten from old furniture shops. As far as finishing the barnwood, I try to use the straightest stock available and the less prep, the better. I used the weathered side for the top and most planing is on the bottom side. I do lots of sanding instead of passes through the planer to leave as much character as possible. I usually will do one or 2 very light passes on the top if needed. Here are a few pictures of some projects of mine that may show the top detail a little better. The first is the top of this table before I added poly. I never stain because the wood darkens as soon as the finish is applied. 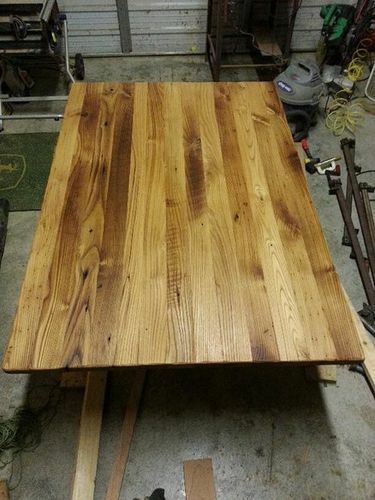 The photos of the second table I sanded only and the countertop had maybe one light pass. This picture will give you a good idea of how much the planer will take off. Check out the saw marks. Mike, thanks so much for the detailed answer and for the pictures. Makes sense about the planing on the bottom side. The grain and saw marks in the pictures are really distinctive and make this such a unique piece..beautiful! i reeeaally like the look of the saw marks on those boards. again- congrats on a really nice build ! 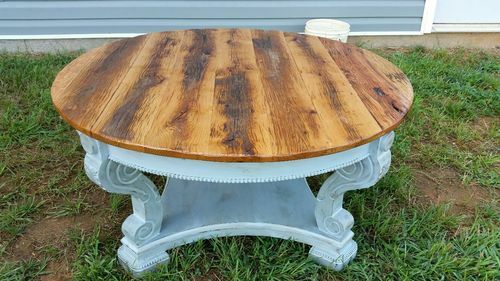 Love the table and the old reclaimed stuff is awesome! 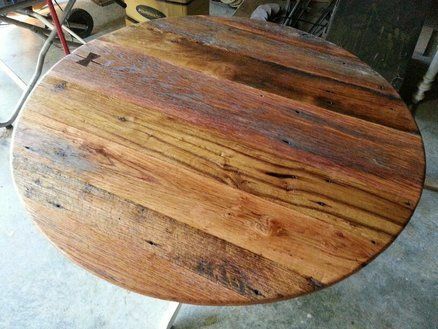 I am working on building a table out of reclaimed barn wood right now also and I am looking around and other examples. The one thing I did differently on my then you did was I was left not much of a choice but to plane both sides of the table. 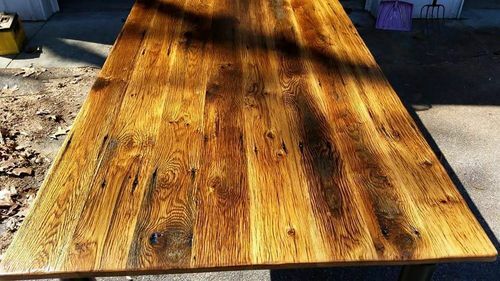 Curious if you have ever had to do this and what you did for finish on something that both sides have been planed…stain…some sort of oil like Danish oil… or just poly it and go with it?? I don’t have a ton of experience with actual reclaimed lumber, a lot of my reclaimed style stuff I use the vinegar and steel wool to make it have that look but recently got a good deal on some barn stuff so I figured I would dive in. i made one thats very similar. it was one of the hardest projects ive ever done. qtr. sawn long leaf pine logs and old oak barnwood. very cool man. i know it was tough. turned out awesome though! Thanks! It really depends on the wood and how you want the top to look when it is finished. Unless you find stock that is perfectly flat and straight (which isn’t the case most of the time) you can get away with less surfacing. Here are a few examples of some of the projects I have done where the wood was surfaced on all sides and just finished with polyurethane. 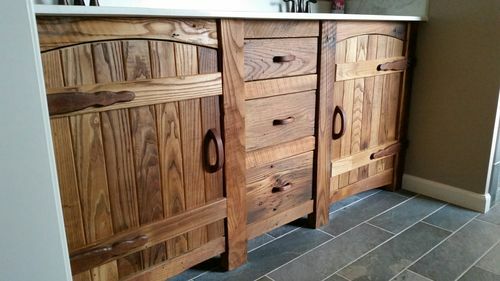 The first three pictures are tabletops made from oak and the big countertop and vanity (last two pictures) are american chestnut. 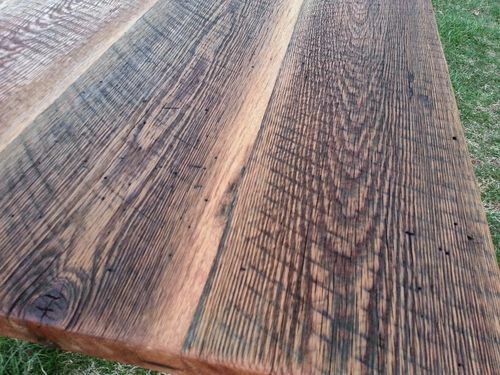 I stay away from staining because I think the variation in the colors is what makes reclaimed wood look it’s best. Hope this helps out and good luck with your table!